Though I’m not clear on the relevance of Mojo to The Doors’ Mr. Mojo Risin’, I am clear on what the subject of Mojo can do. As many of you may have read in a previous post, I married a man from New York—yes, quite an issue for a Southern girl. Once engaged, he remarked once about how swiftly he fell in love with me. Hmm. Why would anyone question how quickly they fell in love with a genius, stunning, personable, sweet Southern girl? Years later, I bought him a saltwater fish and coral tank, and one of the first fish he bought? He named him Mr. Mojo. I had no idea that he remembered that long-ago comment. It was just an off-handed, funny little comeback. Wasn’t it? Evidently NOT! Of course, I hadn’t. But no way could I convince him. Mojos… spells… curses… they all may be more prevalent in the South, but it didn’t start here, and it hasn’t ended here by a far cry. So, what does a Southern writer do with such tidbits of yore? Include it in a novel for sure. ... stopped her car at an old, faded sign that hung askew off a single nail: Madam Laveau. She walked inside to see a woman wearing an African print robe in a dark room. The woman rose to her feet with outstretched arms. A black ghost. Mrs. Delacroix followed the woman, the strongest of the voudoun, out her back door to a lean-to, where she squatted down in the dirt. She pointed to an overturned wash tub for her visitor. From a rusty coffee, can she withdrew bones and stones, shuffled them in her palm, tossed them into the dirt. Mrs. Delacroix held it over the fire. “The Devil’s Flame!” Madam Laveau chanted and handed over the moss-stuffed figurine. Mrs. Delacroix pierced the abdomen, inserting it ever so slowly, prodding, burning, gutting the it in effigy while strange, indecipherable sounds flowed sing-song from the lips of a queen who, for five dollars, was happy to curse the most innocent of innocents with her black art. Of course, her son’s gentle, loving wife miscarries. But this is all fiction, right? Add your story to this blog in the space below. 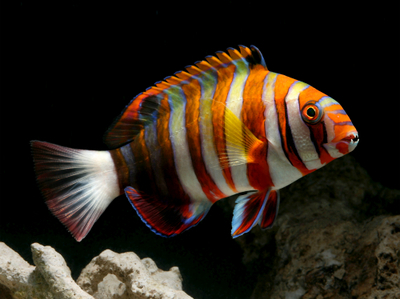 Thank you LiveAquaria for the use of this great picture of a Harlequin Tuskfish! What is nice in the South? Copyright text 2017 by Viriginia Tell.